The PHTX-271 series has been discontinued. Please see the DPU91 as a possible alternative or contact our Flow Engineering department. The PHTX-271 Series Transmitter is designed for broad application and ease of setup and use. The unit auto-configures for either pH or ORP use when connected to recommended OMEGA pH or ORP sensors. Multiple mounting options allow for installation best suited to your particular application. The automated “easy-cal” menu features automatic buffer recognition for mistake proof pH or ORP sensor calibrations. 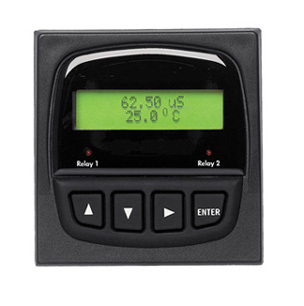 Two-line LCD provides sensor diagnostic information for ease in system maintenance. * Field Mount Transmitters Require FP90UM Universal Mounting Kit. All Panel mount transmitters PHTX-271-XP include a mounting bracket and panel gasket for a NEMA-4X watertight panel installation. Panel mount transmitters fit into a standard 1/4 DIN panel cutout.